﻿ Control System – KONČAR Elektronika i informatika d.d. KONČAR’s control system KONreg SHP 100 is all-in-one solution for full automatization of sHPP. 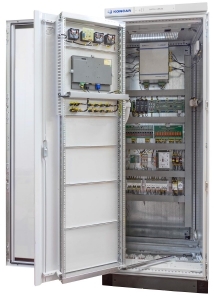 Control, turbine governing, voltage regulation, synchronization, autonomous supply, protection and connection to network are just part of KONreg SHP1000 possibilities. An intuitive user interface ensures ease of use, manipulation and control of all the functions required for the safe and optimal operation of sHPP. Many years of experience and tradition on the field of regulation and governance processes in production of electricity was a result of developing new KONreg platform which we perfected on the existing all-in-one KONreg system.